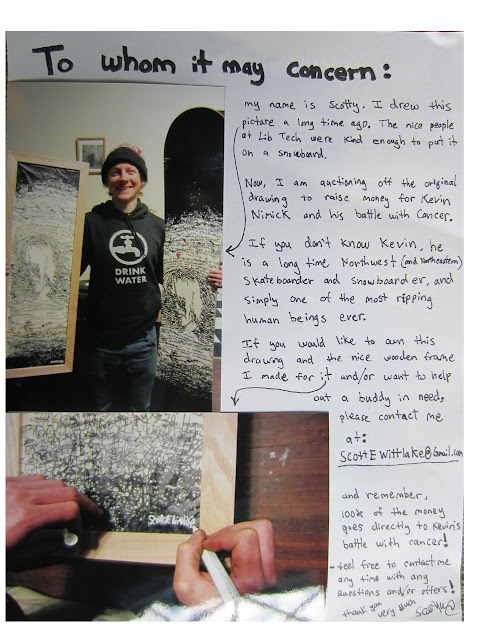 Long story short, you can own Scotty's original artwork (as featured on one of his Lib Tech pro model boards). Just e-mail him @scottEwittlake@gmail.com and bid it up. All proceeds go to Kevin's medical bills. For more ways to donate check out the limited edition Airblaster t-shirt here and the donation page here. Also, check out Kev's Cancer on Facebook. Drop a buck, protect a nut and help support the Portland shred scene. The web site says the shirt "is a new custom fit that is long and slim. It is a premium shirt that feels as soft as a babies bottom." I ordered one immediately. They weren't lying...this is one soft mf'ing shirt. And it comes with a DVD of snowboarding vids!